Africa is lagging behind global progress to meet the Sustainable Development Goal for ‘universal access to safe and affordable drinking water’ services. New knowledge needs to understand and respond to water service inequalities which are not revealed by high quality, but snapshot and infrequent, household surveys. 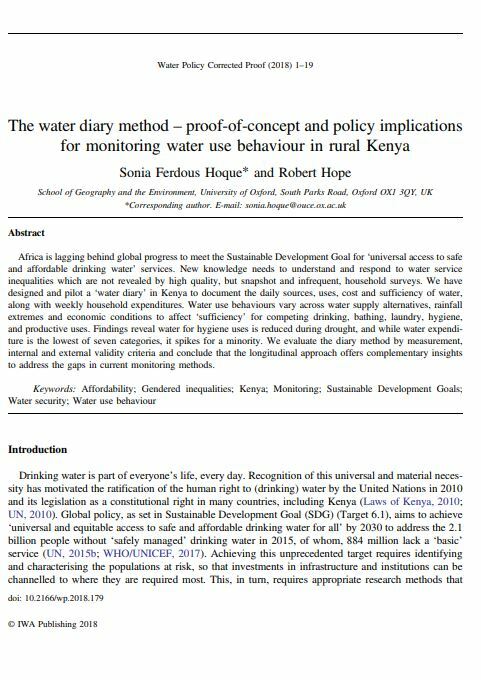 We have designed and pilot a ‘water diary’ in Kenya to document the daily sources, uses, cost and sufficiency of water, along with weekly household expenditures. Water use behaviours vary across water supply alternatives, rainfall extremes and economic conditions to affect ‘sufficiency’ for competing drinking, bathing, laundry, hygiene, and productive uses. Findings reveal water for hygiene uses is reduced during drought, and while water expenditure is the lowest of seven categories, it spikes for a minority. We evaluate the diary method by measurement, internal and external validity criteria and conclude that the longitudinal approach offers complementary insights to address the gaps in current monitoring methods. This paper was published in Water Policy journal, via IWA Publishing. You can access the paper by clicking on the button below. You can also download the open access Author Accepted Manuscript.